Zimbabwe is part of Central & Southern Africa YM, which FWCC lists as having 200 members altogether. 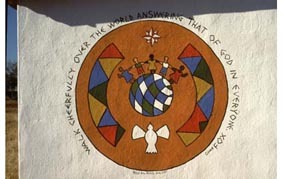 Another major Quaker activity in Zimbabwe is Hlekweni, meaning place of laughter. This is a Quaker training village near Bulawayo offering agriculture, building work and garment making courses amongst others as well as running a school. This year Hlekweni celebrates its 40th anniversary.